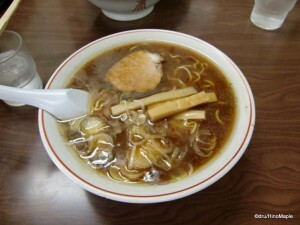 Ramen can be considered one of Japan’s national dishes. Ramen was originally from China, but over time, the old Chinese dish was transformed into what it is today, a very uniquely Japanese dish. Essentially, ramen is just a bowl of noodles in a tasty, salty broth. In reality, it’s much more than that. Ramen is very intricate, where the broth is cooked slowly for days using basic ingredients to make each shop unique. No two shops create the same broth, and no two visits will ever be the same. I have been to the same ramen shop over several years and over time, the staff changes and the taste of the ramen changes. It’s impossible to create the same broth over the years, especially when the chef changes. You can keep the same ingredients, but the portions and the methods always changes. There are four basic types of ramen, and two basic methods to eat it. The major component of any ramen is the soup. The base is usually the same, but there can be two different bases depending on the shop. From the base, they alter the taste in four basic ways. The lightest is “shio” or salt ramen. It’s a very basic soup where they just lightly flavour it with salt. The best version of shio ramen is to filter it to remove any solid matter. The next level would be shoyu, or soy sauce based, ramen. The main difference here is that they tend to add soy sauce rather than salt as a major flavouring agent. 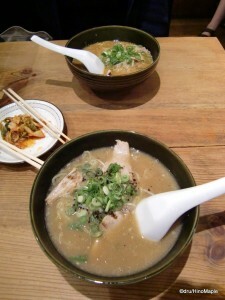 One of the greasiest and unhealthy is the tonkotsu ramen, which translates into pork bone ramen. This tends to be heartier than the other two due to the ingredients. 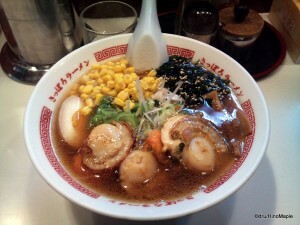 Shio ramen and tonkotsu ramen are almost the same, with the cooking time being the main exception. 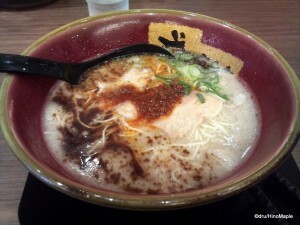 Tonkotsu tends to be better as a hearty meal rather than a nice light lunch as shio ramen. The last type would be miso ramen. This is one of the fattiest types of ramen. When you order this, they traditionally serve it with various sprouts and vegetables, but the amount of oil is extremely visible. Sometimes you can see two or three millimeters of oil and fat on top of the actual ramen. It makes it very delicious, but you can regret ordering it after you finish. The two basic ways to eat ramen is either as “ramen”, where the soup, noodles, and vegetables are all together. The other, a fairly new method of eating ramen is to have tsukemen. This is where the soup is presented in one bowl, and the noodles are on the side along with the vegetables. It’s great in the summer as it doesn’t feel as heavy, and it’s not as hot either. Either way you eat ramen, it’s delicious. 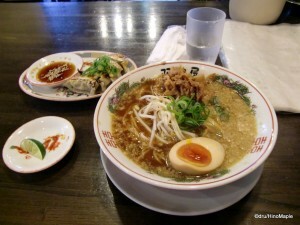 When eating ramen, there are several types of sauces that can be served with it. The most basic “sauce” would be the ichimi, or shichimi. These are types of peppers, similar to black pepper. Ichimi is just one type of hot pepper, while shichimi combines seven types of spices and peppers together. There is a distinct difference in taste. Neither of these is very spicy, but they do add a new character to any ramen dish. You can also add ryu, which is spicy chili oil. It’s similar to a Chinese version, but rather than including dried chili inside the oil itself, usually ryu is a clear red liquid. Black pepper is another basic condiment that is available to add to ramen. While I prefer to avoid this myself, it’s still okay to use it. If you venture into a ramen shop, you may also get a few bonus condiments. These are special condiments that are not available in every shop. You can get things from fried garlic, minced garlic, spicy chili paste, sesame seeds, and many other things. Do be aware that not all of the sauces are for ramen. Vinegar and soy sauce are generally not added to ramen. It is very common to order gyoza with ramen. This is another Chinese dish that has been molded into Japanese cuisine. It is very similar to the Chinese dish of potstickers, but very different. There tends to be more garlic within it, and the sauce itself is slightly different. They tend to mix vinegar, soy sauce, and ryu. All of this together makes a perfect side dish to ramen. Some shops will also offer bowls of rice as an after meal side dish. After you eat ramen, some people have a lot of soup left. A bowl of rice is a good way to make use of this soup. Just ladle it in and you have a good rice soup to finish off your meal. This can be a real challenge for many people as a typical bowl of ramen is more than enough for one person. There are countless other types of side dishes that are available, but they aren’t very common. When looking for a place for ramen, it’s very easy to look in the shopping malls for a shop, but the best thing to do is look around the stations. There is always a small shop within a few minutes of any entrance to a train station. Just pick a direction and find a nice looking hole in the wall. Usually there are only several seats, but no tables. It can be very difficult to order as menus typically come in only Japanese. If you do try to venture into one, don’t worry too much. Just do your best and with a little time, you will get a nice meal. This entry was posted in Food and tagged food, hakata ramen, miso ramen, pork bone ramen, ramen, sapporo ramen, shio ramen, shoyu ramen, soup, soy sauce, Tokushima ramen, tonkotsu ramen, ラーメン, 博多ラーメン, 味噌ラーメン, 徳島ラーメン, 札幌ラーメン by Dru. Bookmark the permalink.